Studying for the Theory Test at the same time that you take driving lessons is the best way to put the theory into practice. Applying your knowledge of the theory and hazard perception skills on the road will improve your chances of passing the Theory and Practical tests first time. DSA for your theory test. To cancel or postpone a booking, notify the DSA booking office at least three days before the test, otherwise you will lose your fee. Your signed photo-card licence and paper counterpart. Your theory test is in two parts. The first part is a multiple choice test, you will be shown 50 questions, you will need to get at least 43 correct to pass this part. you have 57 minuets to complete this section. you are aloud up to 15 minuets before the hazard perception test starts so you can watch a demonstration clip of how to take the test. Candidates can score up to five marks on each hazard and the test contains 15 score able hazards. You click either the left or right mouse button whenever you think you can see a hazard developing. The speed at which you click the mouse button as a hazard develops will determine your score for that particular hazard perception clips. You can score between 0 and 5 on each hazard. The pass mark for this part of the test is 44 out of 75 (i.e. 15 hazard x 5) for car drivers and motorcycle riders. Those taking LGV or PCV (lorry or bus) tests must score at least 50 out of 75. Candidates are given their results when they have finished both parts of the test and have returned to the waiting room. Each hazard perception clip will start with a freeze frame of the start of the video sequence and a count down from 10 will commence. At the end of the count down the clip will start to play and you will be required to click the mouse button each time you see a developing hazards. To let you know that the program has registered your click a red flag will appear on a gray band across the bottom of the screen - one flag for each click you make in any particular clip. At the end of the clip all the flags will be removed before you start the next clip. As an example, of how to identify and respond to a developing hazard, consider a parked vehicle on the side of the road. When you first see it, it is not doing anything; it is just a parked vehicle. 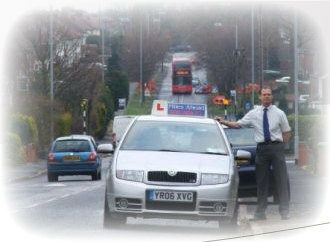 If you were to respond to the vehicle at this point, you would not score any marks, but you would not lose any marks. However, when you get closer to the vehicle, you notice that the car's right hand indicator starts to flash. The indicator would lead you to believe that the driver of the vehicle has an intention of moving away, therefore the hazard is now developing and a response at this point would score marks. The indicator coming on is a sign that the parked vehicle has changed its status from a potential hazard into a developing hazard. When you get closer to the vehicle, you will probably see the vehicle start to move away from the side of the road; another response should be made at this point. Different clips in the test will have various signs to indicate that the hazard is changing its status and is now starting to develop. Each scoring window is divided into five equal segments and a score of five through to one allocated to each. Those responding in the first segment of the scoring window will score 5 and those in last segment a score of 1. Responses outside the window will score zero. If you click the mouse while in the first segment (i.e. just as the developing hazard appears) you will obtain the maximum score of 5 points. If you click in the second segment of this window of time you will score 4 points, then 3, then 2 and then in the last segment just 1. This is accurate to one twenty fifth of a second. If you click the mouse button (this is how you inform the computer that you have seen a hazard) too early, before the potential hazard becomes what the DSA term a "developing hazard". Your score will be 0. Therefore to ensure you get a maximum score in the hazard perception test challenge, you should fully understand the DSA term "developing hazard" as opposed to "potential hazard"
If you click several times during this window of time the computer will always take your highest score and record that for that particular clip. If you don�ft click the mouse button in this window of time you will score nothing in respect to that hazard. If lots of unnecessary responses are made in a very short space of time, or throughout the clip, a zero score will recorded for that clip. If this happens a warning message will be shown on the screen at the end of the clip. When the clip ends the screen will turn black for a few seconds before the freeze frame for the next video clip appears and the count down commences again, warning you to get ready. This pattern is repeated until all 14 video clips have been shown. Hazard perception test - Hints and tips. Although each clip contains several potential hazard only the one that materializes into a real hazard (one clip will have 2 hazards) and involves other road users is marked. This is known as a "developing hazard". Therefore you will only receive a score if you spot a hazard before it fully materializes and is brought about by the action of another road user. In a few instances it is difficult to determine when a potential hazard becomes a developing hazard and therefore when the scoring window should start. This is why it is safer to click a few times as you see a hazard develop to make sure you don�ft click too early and miss the opening of this window.